I love doing whole chickens on the grill and in the smoker. For one, they are so much cheaper than buying packages of chicken parted out, and second, they turn out so nice in the smoker. If you haven’t done whole chickens, I highly recommend it. I just bought 2 for $10! Awesome deal. For the first of my 2 chickens, I decided to make a Sweet and Spicy Pineapple Chicken. I made the marinade and I left it covered in the fridge over night. Here is what you will need to make the marinade. I used a food processor, and added in the Pineapple, jalapeno’s, and garlic and grind that stuff up till its smooth. At this point, You can mix in all the rest of the ingredients into the processor and mix it up for about 10 seconds. 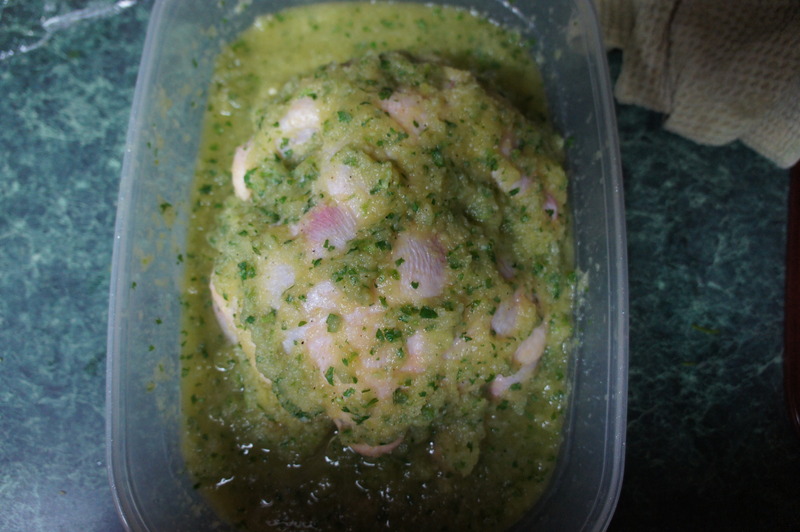 Take the chicken and lay it into a baking dish and cover the chicken with your new marinade. I even rub the inside of the chicken with the marinade. Cover the baking dish with plastic wrap and throw it in the fridge over night. 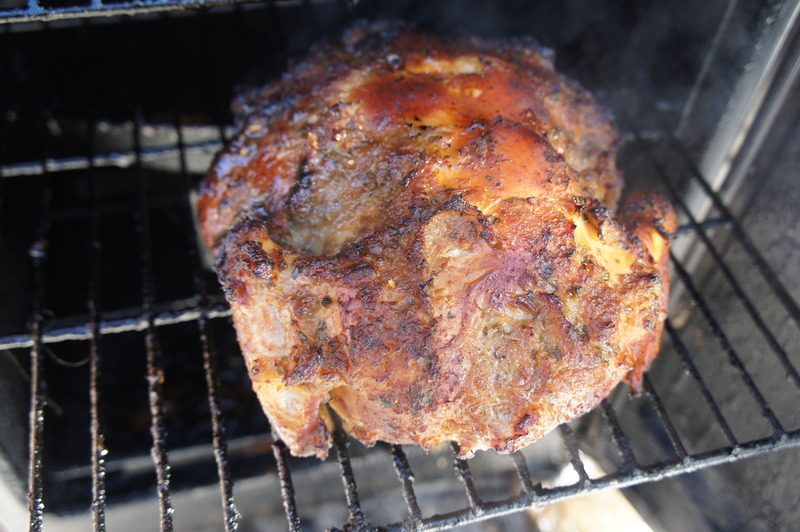 I turned the smoker on around 7 am the next day and set it to 275 degrees. At this time, I also started soaking some mesquite chips in a bucket of water. 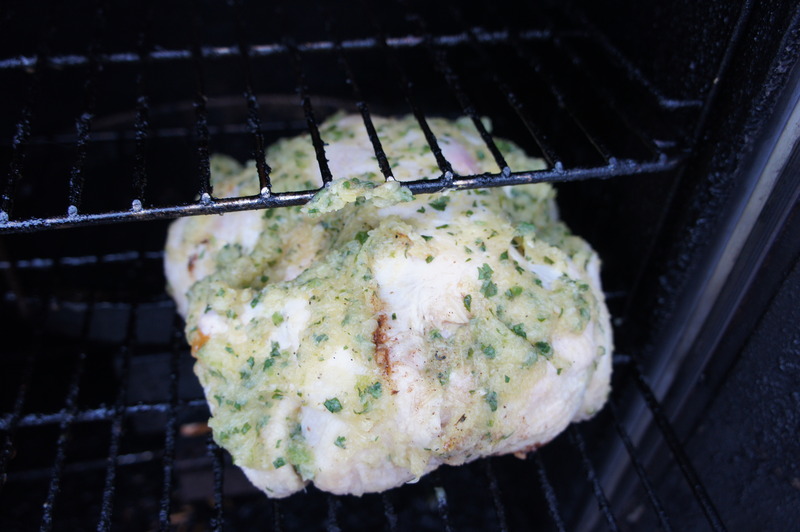 Once the smoker reached temp, I set the chicken in on the second to bottom rack breast down. I closed the door and opened the vent on the top about half way. The chickens take about 3 to 4 hours to reach 160 degrees internal temp. A good way to tell is when the legs start to pull away from the chicken. The skin will get a nice brown color to it as well. Once it hits 160, go ahead and pull it out and let it sit for about a half hour. Once it cools to the touch a little more, I pull the skin off. 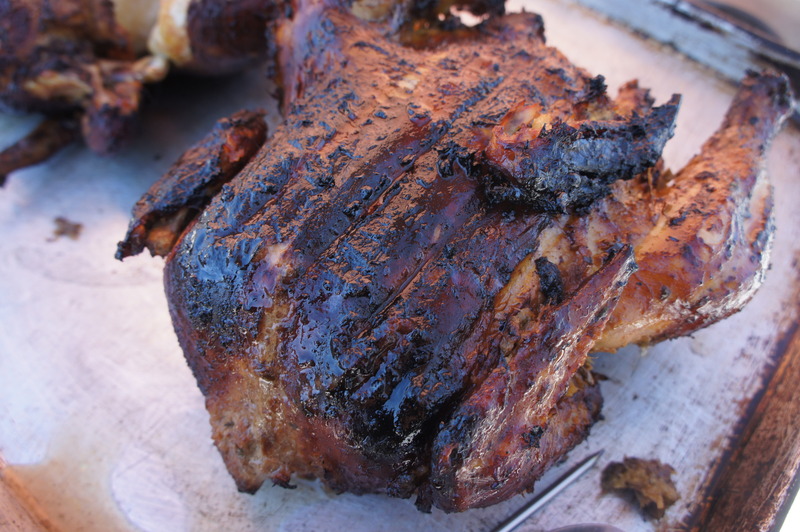 Its usually the fatty feeling skin over the crisp skin you get when you bake or grill chicken. It shreds so easy at this point, that I recommend just pulling it apart and putting it in a bowl. Now that its done, the possibilities are endless for what you can do with it. We made a little into a pasta salad, and the rest went into making sandwiches. We drizzled BBQ sauce over them and they were incredible! 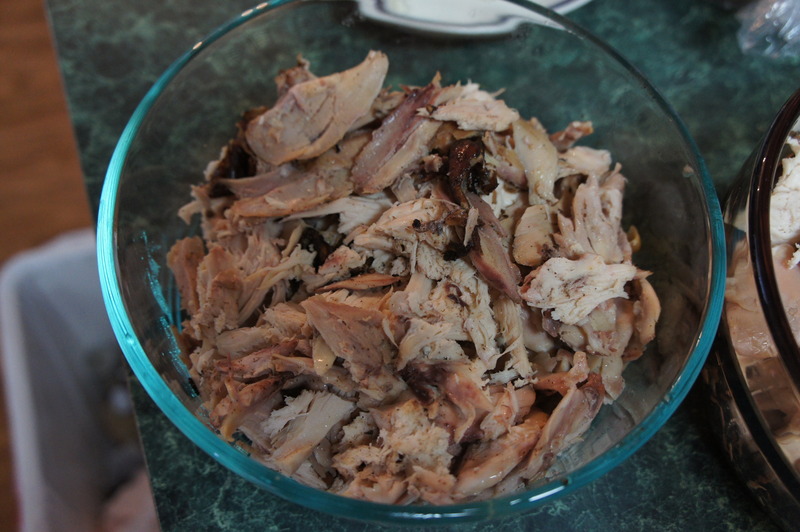 Here is a link to my awesome BBQ sauce I like to make in the smoker. One downside of doing marinated chickens in the smoker is that you loose a little of the marinade flavor because smoke flavor can be that much more over powering. I would recommend closing the vent to about a quarter open so less smoke is created and using a milder smoking wood like Maple, Ash, Alder or Apple.